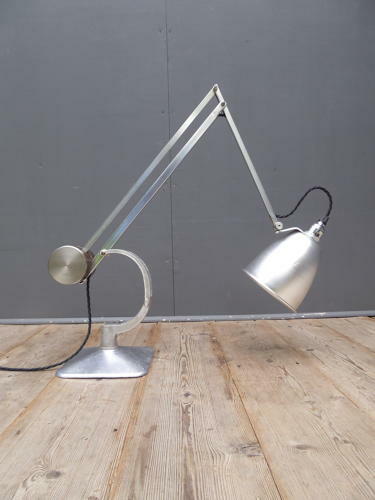 An original vintage Hadrill & Horstmann counterbalance lamp. An early & great looking example of this industrial design classic featuring the iconic cast iron counterbalance mechanism. The lamp comes in an bare metal finish which highlights the quality of the engineering & gives the lamp a wonderful 'raw' feel. A simple, handsome & timeless desk lamp. Wear commensurate with age as pictured, very good overall with expected light marking here & there & some pleasing discolouration to the counterweight. Height measurement is taken in the classic position as per third image.